The gospel of Thomas comprises a collection of statement by Jesus to his half-brother, Thomas. There is a deep wisdom inherent in them, which gets lost at the level of scholarship. 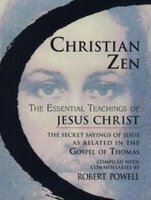 As implied by its subtitle, "The Secret Sayings of Jesus", the work repsresent an esoteric teaching, meant only for a certain elite. ... Properly understood, however- that is, with the proper magical key, we find in Jesus' Sayings a most beautiful presentation of the timeless teaching of Advaita (non-duality), the esoteric expression of the inner meaning of all the great religions. i was just thinking, the world TAWHID (also writen as Tauheed, Tawheed) used in Islamic terminology, the Absolute Oneness of God's Being is perhaps the fittest term for Advaita (not-two). This is also confirmed in the sacred formula of testament, La sharika lahu, there is no second to You, You have no partner, there is no-two but You. The books contains the beautiful sayings of Jesus Christ and with short enlightening explanations. I quote two of such sayings. 1. Jesus said, "If they say to you, 'From where did you come? ', say to them, 'We came from the Light, where the Light came into being of its own accord and established itself and became revealed in its image'. If they ask 'Who are you? ', you answer: 'We are his children and are the elect of the Living Father'". 2. His disciples said to him: "Tewnty four prophets have spoken in Israel, and they all spoke of you." He said to them, "You have disregarded the living one who stands right before you and have spoken about the dead." :: Jesus dismisses all this gossipy talk as unproductive, abstract and therefore dead knowledge. What has value is not hearsay but the presence of a living teacher who alone can effect direct transmission of the teaching and bring one nearer to realization. Credit: You may read from limited preview from Google Book. here is the link.